Whispering Oaks Arabians, home of 16.2hh Russian bred Arabian Stallion TLA Halynov, has been selling Arabian horses for show, race, and performance for over 15 years. Our Arabian horses combine the best of athletic conformation, movement, and beauty with sensible and willing attitudes. They are successfully shown by their amateur owners and quickly become family friends. If one picture says a million words, imagine what a video would say! We encourage you to discuss your interests with us or complete our easy contact form so that we may send you a video or DVD of the prospects listed below. There is currently of shortage of athletic Arabian horses as a result of performance horse breeders limiting breeding when the market was demanding halter lines (pretty yet most couldn't really move out!) Halter classes are now taking a back seat to the Sport Horse Classes! People now want Arabian horses that are not only pretty, but are athletes as well!! Take advantage of our Russian and racing bloodlines that are known producers of quality athletes! We are pleased to offer these Halynov line geldings below. 2008 Son of Solstar out of sporthorse champion TLA Halynov daughter Mamma Mia ! and IIWP Solstar, son of Champion Explodent . Hal’s Star has been in pasture all his life with his half and full brother. He is smart yet very wanting to please. Click above for his video and here for his baby slideshow. He is a great result of champion bloodlines. Click here on link for more information on Halyva Star. 2006 Son of Hals Riverdance out of Narova -- full brother to Halyva Dancer , he is now old enough to begin serious sport or show training and has no bad habits, respectful ground manners, and a very willing and gentle disposition. Look at his video and see him move! View conformation shots on sire Riverdance’s offspring page. He is nephew to one of our best, Halyva Guy . C lick here for more info on WOA Dancer. 2008 Riverdance son out of WOA Sheza Showoff, by Russian import *Napadki with close ties to Priboj. Heeza's exquisite motion is a result of his incredible bloodlines. 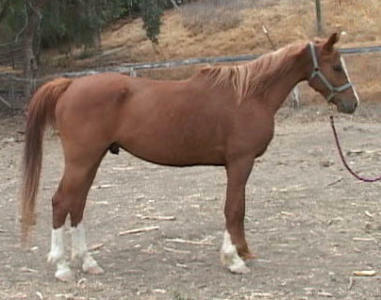 Click Dancer for his sire's video and Sheza for his dam's. Athletic bloodlines produce athletes! Click on his video and see him move! Click on names to view grandsire TLA Halynov and grandsire Napadki’ s videos. Whispering Oaks Arabians, home of 16.2hh Russian bred Arabian Stallion TLA Halynov, has been selling Arabian horses for show, race, and performance for over 15 years. 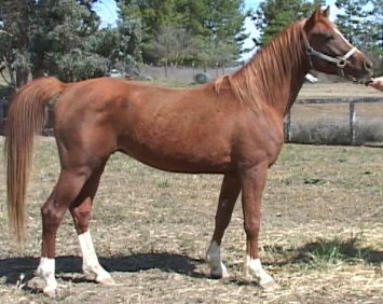 Our Arabian horses combine the best of athletic conformation, movement, and beauty with sensible and willing attitudes. They are successfully shown by their amateur owners and quickly become family friends. If one picture says a million words, imagine what a video would say! We encourage you to discuss your interests with us or complete our easy contact form so that we may send you a video or DVD of the prospects listed below. There is currently of shortage of athletic Arabian horses as a result of performance horse breeders limiting breeding when the market was demanding halter lines (pretty yet most couldn't really move out!) Halter classes are now taking a back seat to the Sport Horse Classes! 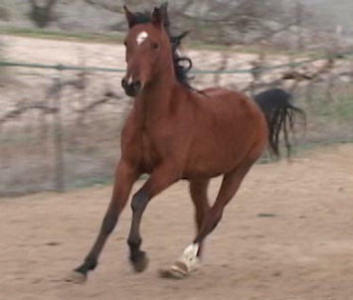 People now want Arabian horses that are not only pretty, but are athletes as well!! Take advantage of our Russian and racing bloodlines that are known producers of quality athletes! We are pleased to offer these Halynov line geldings below.